When nothing is going wrong to us individually, that is of which we are aware, life in the fast lane is bliss. But, as our knowledge grows our surroundings, enforinment, or culture within which we live and our understanding of outcomes or consequences increases, bliss becomes tainted. This is precisely the situation King Zedekiah finds himself in chapter 21. He suddenly realizes, better said, he finally accepts as true knowledge with the beginnings of understanding, what Jeremiah has been prophesying is now surrounding the cities of Judah and Jerusalem; i.e. Babylonian troops. JIV INSIGHT: Pashhur son of Malkijah is not the same Pashhur we discussed in chapter 20. The second Pashhur is mentioned in Jeremiah 21:1. The “Zephaniah” mentioned in the same verse is NOT the same man who wrote the Book of Zephaniah. *Zephaniah the author is Zephaniah the son of Cushi and one of the twelve Minor Prophets. Zephaniah in verse 1 of C21 is Zephaniah the son of Maaseiah, a Levite priest. *Zephaniah the son of Cushi and author of the Book of Zephaniah is the great, great grandson of King Hezekiah of Judah but he is NOT the same Zephaniah (Levite) mentioned in chapter 21. When one looks down the road of potential trouble (such as Babylonians on the march in this chapter) we try to take escape or evasive action. NOW Jeremiah is suddenly important to the leaders of Judah, both the religious (Zephaniah) and the secular (Pashhur). We see this in the selection of these two as negotiators sent from King Zedekiah to Jeremiah. There is nothing in this request from King Zedekiah to Jeremiah to pray for the sin of Judah and its leadership or a hint of repentance. The intent of their heart is to escape or evade; not return to the God of Israel. They are hoping that God will deliver them as he has done in the past histories of Israel as a nation and later as the (southern) Kingdom of Judah. 1 John 1:9 If we confess our sins, he is faithful and just to forgive us our sins and to cleanse us from all unrighteousness…but only if and when we confess them. Jeremiah 21 verses 4 and 5 are a comparison and contrast with Jeremiah’s tenure in history and the coming Apocalyptic End Time but we can draw comparisons. Verse 4 is very similar to both Jeremiah’s and End Time but the oxymoron with End Time is found in verse 5. Verse four tells us that the weapons of Judah will be useless against such an enemy (Babylon) just as as they will against a 200,000,000 man enemy of End Time. Both times God will bring the enemy into the city of Jerusalem itself. However, in verse five, God says (ESV) “I myself will fight against you with outstretched hand and strong arm.” In End Time Revelation 19:15 we are told Jesus will fight the battle for Israel against the overwhelming odds circling Jerusalem; destroying the enemies of Judah/Israel with the words of his mouth. Verse six it is similar in events coming to the world during the 2nd [black] and 3rd [red] horsemen of the Apocalypse; pestilence, disease, starvation, death on a great scale. But verse 7c needs a bit of insight. It reads: “and he shall smite them with the edge of the sword; he shall not spare them, neither have pity, nor have mercy.” This is NOT GOD doing the smiting, but Nebuchadnezzar and his armies. Verse 8 & 9 are conditional promises just as stated in previous articles from this website regarding God’s intervention or help… “If you do ____, then I will do ____”. The total statement goes through v10 but here is the gist of it. “…and he shall smite them with the edge of the sword; he shall not spare them, neither have pity, nor have mercy.” But verse 8 also gives a condition of choice, just like we have today. It says, understand that I will let you choose to live or die” (but you must___.) This too is very similar to End Time issues surrounding Jerusalem (Revelation 12:6 where the woman referred to is Israel). We can learn much about the end of the Church age by studying the O.T. histories of actuality an alternative word for Israel. Much is foreseen in Daniel and spoken of in Matthew 24. It is in Luke 21 (20-24) where we draw the parallel of Jerusalem being surrounded by enemy. We also can’t leave out references in Zechariah 14:1-3 or Joel 2:1-10. There are strong parallels in each of these passages. NOTE: The bible student will look up these passages where the casual reader will read on. Both may be students of the Word but the casual reader is seeking awareness and the student who searches is fulfilling a need for knowledge and understanding. Who are they who must flee so urgently when the last days begin? Who dare not hesitate long enough even to go back into the house to pick up a wrap, but must immediately head for the hills? There is no need to wonder, for the Lord says plainly, “those who are in Judea” Now Judea is a geographical part of the land of Israel, ancient Palestine. It comprises the hill country surrounding the city of Jerusalem and includes the city as well. It is to the residents of Jerusalem and Judea that this warning is addressed. Furthermore, the Lord’s mention of the Sabbath establishes the fact that these residents of Judea are Jews. He urges them to pray that their flight will not be in the winter, with its distress of cold, or on the Sabbath, with its travel limitations, for Jews are allowed to travel only a short distance on a Sabbath day. Later in this passage these Jews are called “the elect” (“for the sake of the elect those days will be shortened”), and this makes clear they are believing Jews, that is, men and women of faith who know and love Jesus Christ as Lord and are prepared to live or die for him. They are not Christians in the usual sense of that term, referring to those who are members of the church, for we are told that in the church there is neither Jew nor Gentile, bond nor free. Jews are not to be distinguished from Gentiles within the church. These distinctions, we are precisely told by the apostle Paul, have been invalidated in the church. The “middle wall of partition” has been eliminated; there are no distinctions of background, race or religious training that are recognized within the church of Jesus Christ. Furthermore, Christians, we are told, are free from the law and no longer observe special days, special feasts, new moons and Sabbaths. In his letter to the Colossians the apostle Paul clearly speaks of the fact that the Sabbaths were included in those shadows which were done away in Christ. But here the Sabbath distinctly will be a restricting factor in the flight of these people. Here then will be a class of people who cannot be identified with the present day church but with Jerusalem. These people will be Jewish believers in Christ who will be converted after the removal of the church and before the time of the Great Tribulation. 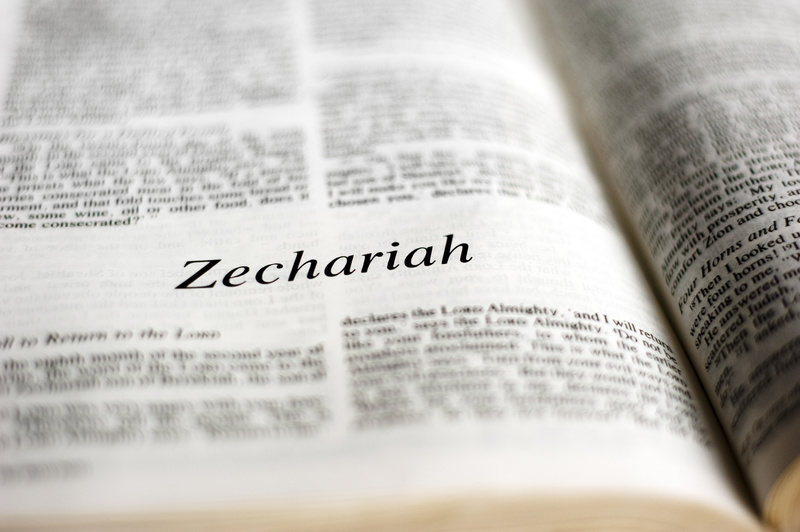 Zechariah was written to comfort and encourage the returning Babylonian remnant to repent of their evil ways, to return to the Lord and to rebuild the temple. The people who had just returned from Babylonian exile felt like their efforts were insignificant and the future was uncertain. Not only were they just a remnant of the Jews, their kindred tribesman of Judah who still lived in Babylon, they weren’t even an independent nation – just a client state of a mighty Mede-Persian empire. Zechariah’s message focuses on the future of Israel-Judah and proclaims that God would send the Messiah to establish His Kingdom through the submission, then destruction of the Gentile empires; i.e. the salvation of His people Israel. Most Bible students think that the *visions connect together somehow. Unfortunately, they do not all agree on how they connect. *visions 6, 7 and 8 are about the removal of *sin. *visions 3-7 are about the future of Judah/Israel as a nation. Probably both ideas are useful to Bible students. Zechariah 2:4–5, 10–13 Christ will dwell with His people (see Revelation 22:1–5). Zechariah 3; 6:10–15 Joshua is a type for the great High Priest (see Hebrews 3:1). Zechariah 3:8–9; 6:12 Jesus is the Branch who will atone for us (see Jeremiah 23:5–6). Zechariah 9:9 Jesus will enter Jerusalem triumphantly as King, riding a donkey (see Matthew 21:1–11). Zechariah 11:12–13 The Savior will be betrayed for thirty pieces of silver (see Matthew 26:14–16; 27:3–10). Zechariah 13:6 The Jews will ask Jesus about the wounds in His hands (see D&C 45:51–53). Zechariah 13:7 The shepherd will be smitten and the sheep scattered (see Matthew 26:31). Minor Prophets: There is a coded Bible message within the Minor Prophets and the focus of their writings or meaning of their names. Read the following as if it is a statement. WHY? Because there is a message to “them who have ears to hear” (Revelation 2 & 3: to the 7 churches). Salvation, the Day of the Lord; YHWY is God; carried the servant of YHWY, the divine judgment and restoration of Israel [like a] Dove [of peace]. Who is like YHWY, the comforter? Embrace YHWY [for a] festival and celebration [is] hidden. YHWY remembers [his] messengers. Yes, there are hidden bible codes; coded messages of reassurance to which we must pay attention but only those close or in tune with GOD/YHWY will ever understand.